I recently contributed this dukkah recipe to Food 52’s Small Batch series. When they first suggested it, I had to look up how to (authentically) make it. It turns out — there’s no one way. 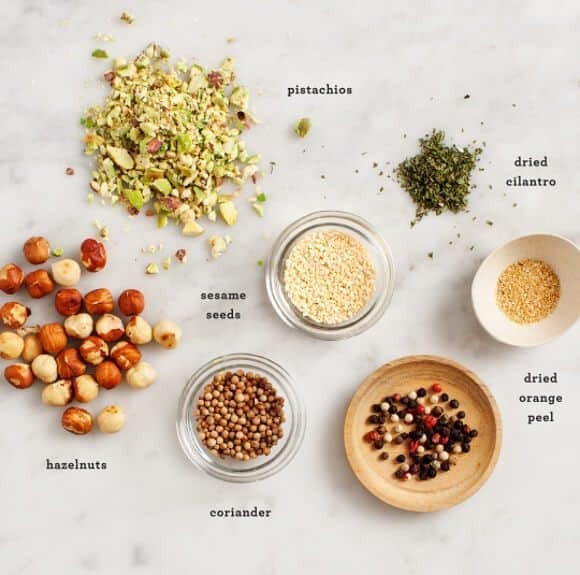 The word dukkah literally means “to pound” and it generally consists of hazelnuts, sesame seeds and a few whole dried spices. To me, this was the perfect opportunity to use up the nuts and spices I had just cleaned out of my pantry shelves. (Specifically, the ones that didn’t fit when I transferred them from little bags to little jars). Along with the hazelnuts I had been hoarding, I toasted and crushed: pistachios, sesame seeds, coriander, dried orange peel and dried cilantro, and dried peppercorns. (Feel free to change up this combination using ingredients you happen to have). It’s a great little spice mix to keep on hand (it’ll keep for awhile!). I sprinkled it over greek yogurt and served it with pita chips. 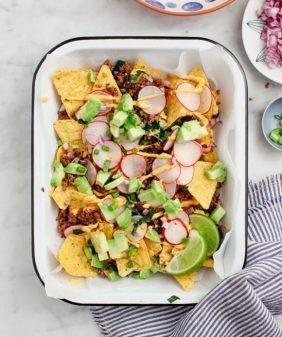 It’s a super delicious snack, not to mention a great make-ahead throw-together appetizer. Using a small, dry skillet over low heat, toast the hazelnuts for a few minutes, until fragrant. Next, add the pistachios and the coriander and toast for a few minutes more. Next add the sesame seeds, peppercorns, and orange peel. Toast those for one minute more, then remove the skillet from the heat, mix in the dried cilantro, and add a few pinches of salt. 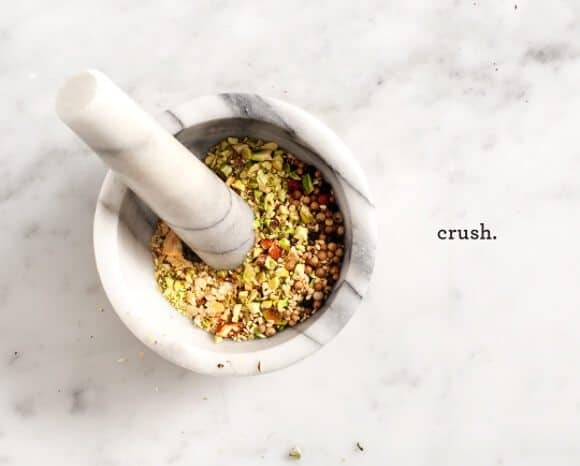 Let the mixture cool, then crush it in a mortar and pestle or pulse it in a food processor. Instead of letting the mixture turn into a paste, stop mixing when it’s still a dry crumble. Mix greek yogurt with salt and a bit of lemon juice. Sprinkle dukkah on top along with a drizzle of olive oil. 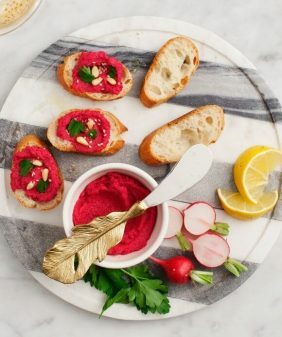 Serve with toasted pita or pita chips. Other uses for dukkah: serve it simply with olive oil and baguette. Toss it with roasted vegetables, or use it to crust meat or fish. Store in an airtight container at room temp for at least a month. I flipping love dukkah. 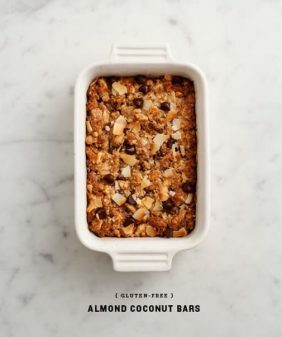 This recipe looks so yummy!! Wow, absolutely beautiful! Yogurt is all the rage lately, it seems. I definitely do not get enough use out of my mortar and pestle, so I’m looking forward to checking this out! I love dukkah! I just found out about this spice and it’s wonderful! I love the chunkiness of it! The one I have, has almonds in it – delicious! 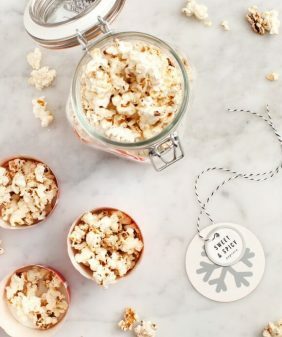 Definitely want to try with pistachios! What a pretty green color! I love Dukkah. I take the short cut and purchase the premade one at Trader Joes. My favorite way to use it is to sprinkle it over a toast with avocado.I love this for breakfast. So far, my only dukkah experience has been with the Trader Joe’s version, which I love! Yours looks a million times more flavorful. Can’t wait to try it. P.s. congrats x1000 on the Saveur win! I was so happy to see your name at the top of the list. You deserve it. I haven’t heard of this before. It sounds amazingly flavorful. 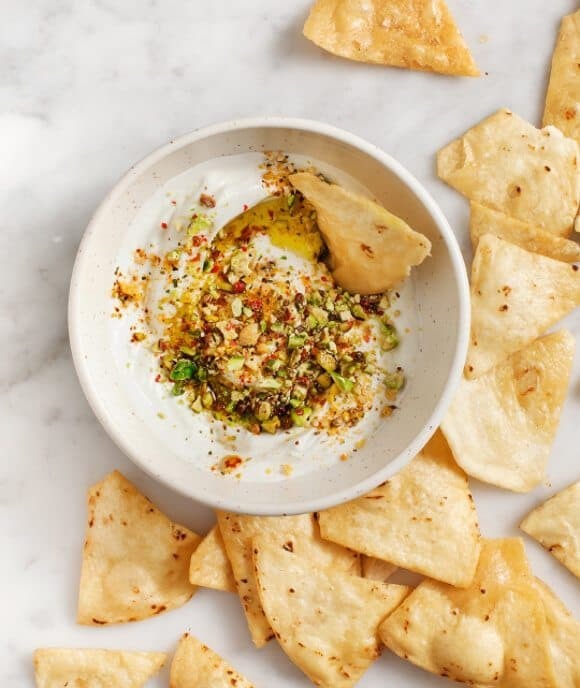 I love dukkah and this recipe sounds fantastic! Mmm. This looks so good. This sounds so good! Beautiful photos! This looks so yummy and exotic yet uses such simple pantry ingredients, pinning! Oh my, that looks lovely – but where on earth did you get the dried orange peel? I’m gonna have to go looking here in London, I bet that added some wonderful flavour…..
I’m thinking fancy spice stores or Whole Foods might have it in their bulk section? If you can’t find it, you can just skip it or maybe even add some fresh zest at the end. I accidently double bought yoghurt this week, and I have a load of half empty bags of nuts and spices lying around. This couldn’t have been timed better! i have a little jar of dukkah from trader joe’s sitting in my spice cabinet and every time i look at it, i’m like, well what am i supposed to do with you. Oh man, it looks so yummy. Beautiful presentation. Hearing this for the first time. The photo tempts me and I will try it asap. 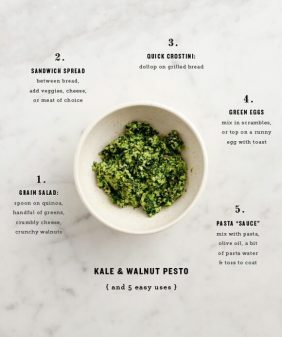 We just started carrying dukkah…will have to try this! I can’t wait to try this!! Looks divine! I’m a big fan of yogurt dips… and the secret I’ve found is all about the yogurt. If you go with a sheep double strained Greek variety you’re in the clear. You want it to be thick (almost like a cream cheese) and without an over powering flavor of tart so it can take on the full flavor of your concoction! 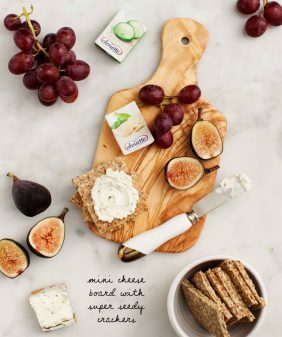 If you live in LA, I swear by Aris brand… and they’re lactose free! I made this a few days ago , served the Dukkah with Vanilla Bean Greek Yoghurt , had visitors and we all loved it including my fussy husband.